Thousands of students from African countries pursue their education each year through the support of The MasterCard Foundation Scholars Program. Becoming a MasterCard Foundation Scholar can be a life-changing moment that opens up opportunities to study at top universities in Africa and around the world. Madit grew up in a farming community in South Sudan during a time of civil war. As a MasterCard Foundation Scholar, he is now studying business, economics, and public policy so that he can set up a college preparatory program in his home country after graduation. Stories like Madit’s are what make The MasterCard Foundation Scholars Program such a powerful and transformative program for the next generation of African leaders. MasterCard Foundation Scholars are driven academically and dedicated to their education, but the experience of adapting to life at university can be daunting without a support system. The need for support continues after graduation as well. Many Scholars return home to lead change within their communities, but require connections to resources, collaboration with others and continued education to accomplish their goals. Together with Arizona State University and The MasterCard Foundation, we set out to design a community that would support Scholars throughout their education and set them up for success long after graduation. The result was Baobab, a social learning platform that elevates scholarship into a source of lifelong learning and empowers the next generation of African leaders to create social change. Named after “Africa’s Tree,” Baobab is a social learning platform where Scholars gather to share knowledge, exchange ideas and learn from each other. It fosters connection and collaboration within the Scholar community, provides a curated learning environment, and maximizes mentorship opportunities. Throughout every step of the design process, Scholars provided direct input into what they were looking for and needed from Baobab, and we used their experiences studying at university and returning home to inform our design process. MasterCard Foundation Scholars expressed that the Baobab experience would need to prioritize conversation around real issues, make opportunities and mentors more accessible, and provide resources for continued learning. As a result, Baobab is built on principles of inclusivity, community, and connection. All of these design principles keep Scholars at the front and center of Baobab and give the platform purpose beyond the typical social network. Community and connection are central to Baobab. Before Baobab, Scholars had no way to easily connect with fellow Scholars involved in The MasterCard Foundation across campuses and programs. 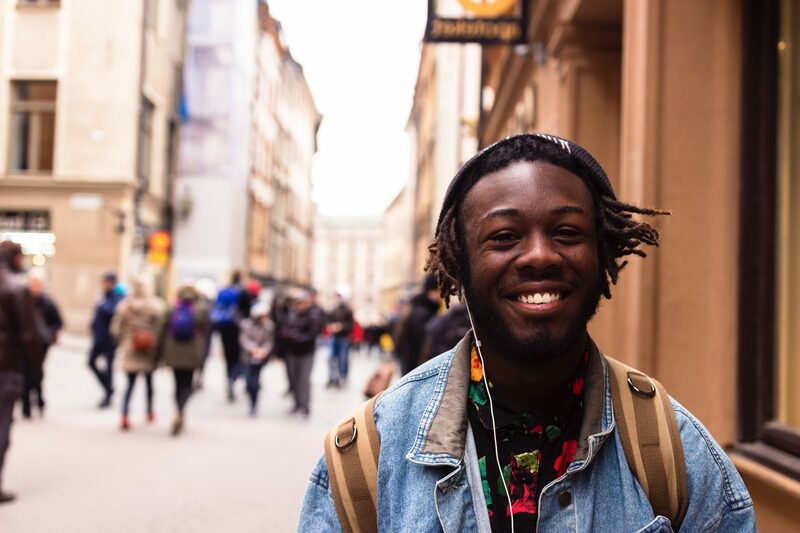 One Scholar recalled finding out about his scholarship and being so excited to connect with others in the program that he spent hours scouring Facebook just to find other students with African names. Baobab acts as a digital rolodex, giving Scholars instant access to a community of students like them who share their experiences and can serve as a built-in support system as they adjust to life in a new location. Scholars said that using social networks like Facebook often felt intimidating and unfocused due to an overwhelming amount of content that blurred serious subjects with personal sharing. We therefore designed Baobab to look and feel streamlined and structured. Rather than asking Scholars to just “share,” we designed sharing around specific prompts that act as a guide for Scholars and encourage concrete ways to start conversations. For instance, Baobab asks Scholars questions like “Who is a leader that inspires you?” and “What is something positive that you have achieved this week?” provide structure to sharing so Scholars feel more inclined to add their voice. As a result, Baobab has become a lively forum for Scholars to discuss anything from how to register for classes to economic policies shaping Africa. Upon returning to their home countries, many Scholars experience financial instability, barriers to networking and unemployment rates that can surpass 30 percent. For them, Baobab needed to go beyond the normal conversations and sharing of social networks: it should also be a conduit to career growth, professional development and mentorship connections. We designed space within Baobab for Scholars to meet career mentors and find job opportunities to accelerate their success once Scholars return home. Specially invited African business and community leaders participate in Baobab as mentors and chat directly with Scholars, answer their questions and provide valuable professional advice. Mentors have shared insights with Scholars on a range of topics, such as how to navigate male-dominated professions. 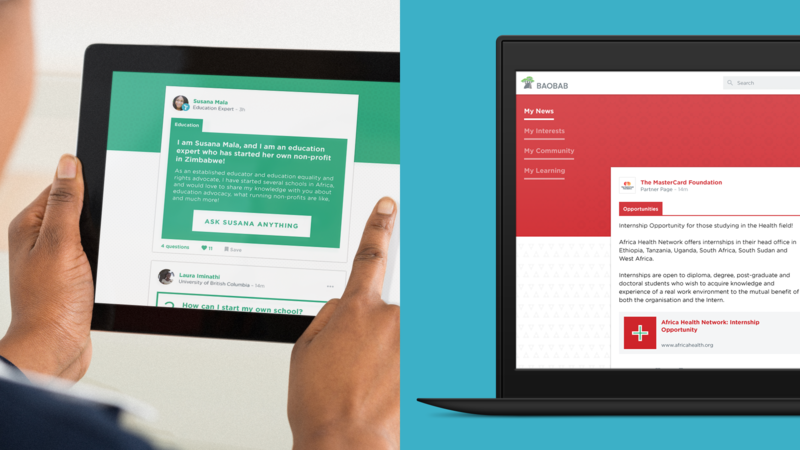 In keeping with the desire for a sense of focus, Baobab provides a curated editorial experience that recommends conversations and connections to Scholars so that they can easily align their personal and professional goals within the platform. Scholars are stronger together when they can exchange ideas and learn from each other. 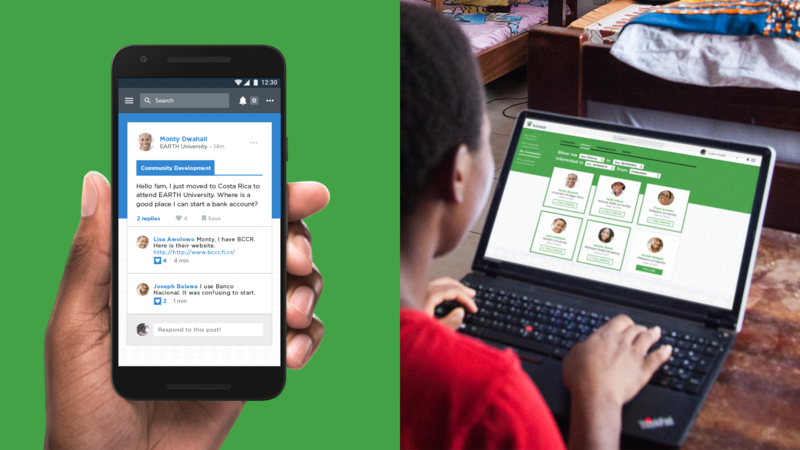 With the workgroups feature on Baobab, Scholars can join forces and share resources on common challenges like opening a school in their community or designing initiatives for child healthcare. A growing library of content, like courses in design thinking and transformative leadership, provide Scholars with resources that can help them accomplish their shared goals, boost their resumes, and attract employers. Scholars can use Baobab as a resource wherever they go because it is designed for quick loading and accessibility in mobile-first, low-bandwidth markets. 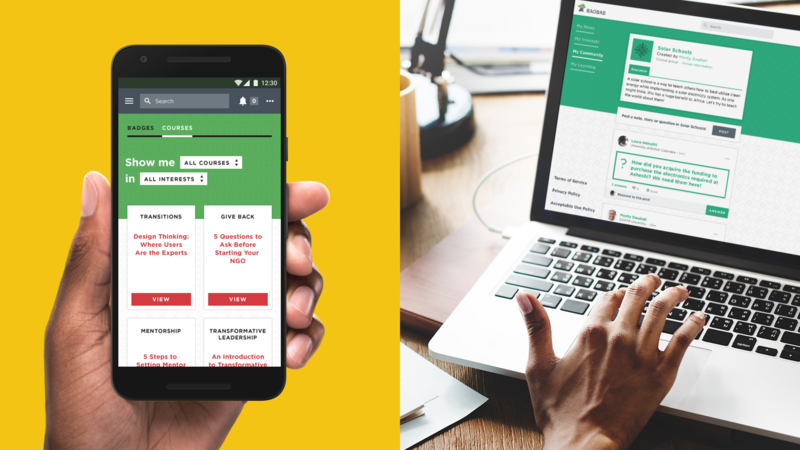 With resources for lifelong learning and workgroups in your pocket, Baobab helps combine the energy and effort of Scholars as they create change across the African continent and within their own communities. Today, more than 2,000 Scholars from nearly every sub-Saharan country use Baobab, with thousands of new users becoming eligible each year. Scholars use the platform daily to connect with others, tackle shared challenges and find inspiration and guidance from mentors. Like Africa’s Tree, Baobab is a place for the next generation of African leadership to come together as a collective force for change.